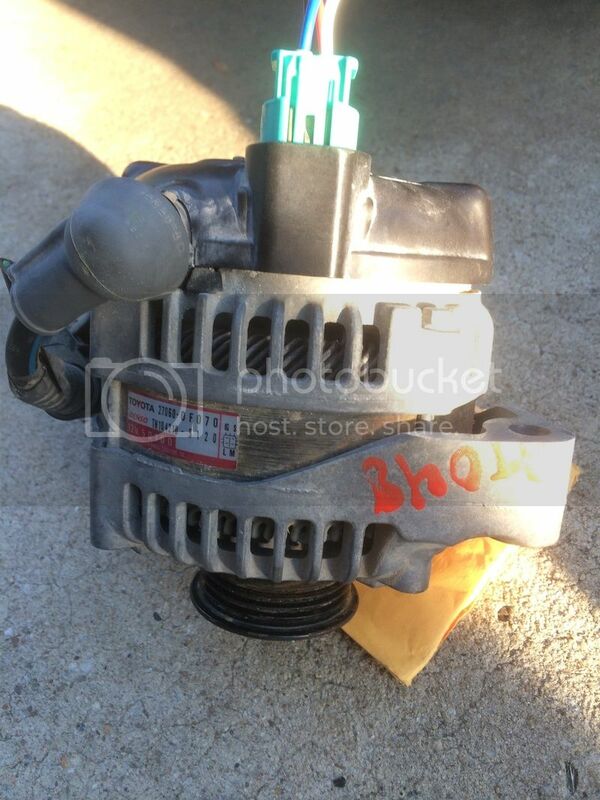 I am looking to use my old KAE alternator on my LS swap and I can't find any info on the wiring for it. The main ground and power are easy, but there are two other wires - one presumably a switched ignition and one for the dummy light. Does anybody know which of the two wires on this plug is the switched ignition wire? Pop off the column cover and take a peek. I'm almost sure the red/white one is it. I think the plain white one is power from the fusebox. W/R is the one from the "dummy light"
Its what controls the charging, not actually just a dummy light thing. The real question is why the hell are you trying to use a KA alternator on an LS1 ??? Just the LS1 swap alone already requires more current capability, then account for dual electric fans, you're well past the KA's output, unless this is a severely stripped down car electrical wise. The other one is not switched. It's hot all the time. That small White/Red wire controls a lot actually. The KA alt. actually provides a switched ground source to that wire. If you don't wire it up to a switched ground on your LS swap all kinds of bad stuff happens. The battery light will be on as soon as you turn the ignition on and it will stay on. When you turn the ignition to start a few other warning lights and circuits will go nuts and stay on until you disconnect the battery. I chased my own tail for a few days on that one. So long story short, find a switched ground source and splice the white/red wire into it. I have a seat, a steering wheel, and a shifter. No radio, no power anything, manual steering, etc. 80A is more than enough for my car's needs. Thanks for the info guys. I will see how my swap harness guy wires up the harness before I start digging any further into things. 15A for reverse lockout and a few other things. ETC, makes for the idea of using a KA alternator for some awful reason, a bad idea. You're putting forth effort to take a step backwards, this makes no sense. That's interesting, and I do see that you put some effort into dissuading me from my original intention. I had assumed that the stock KA alt would be enough due to having read that there were several semi popular race units available for the LS series engines putting out 45-60A max. Also, It would appear that your potential power draw numbers are a bit optimistic as the stock 98-00 C5 Corvette's alternator is only a 105/110A unit and that is powering a car with a full stereo system, power heated seats, and the like. My main reason for using the KA alternator was that it is light and I have one sitting around that nobody seems to want. Kill two birds with one stone.. But how much less/more do your older headlights draw ? Power seats is something that only gets used momentarily, the electrical system doesnt care if its got to catch back up a bit. But when you're combining all of your systems that are likely to, and will be on at the same time, thats what's going to matter, going with something too small is going to end up making other components that benefit from more voltage (injectors, coils, and fuel pump) end up suffering and performance may suffer as a result. We're realistically looking at what ? 3-4 lbs ? Plus the headaches of a different bracket, possibly pulley also, for that ? Trust me, having driven LSx Schassis, and doing enough work on them, just leave it alone and be happy you've got an alternator upgrade. BTW the fuse references were from a 04' GTO, I had them on the top of my head because I'm currently building an S14 with everything factory still in tact on the inside of the car, power accessorys etc, and wanted to make sure not to overload anything on the original electrical system, sure enough the injectors/coils alone have the same fuse as the oem B/R main power wire for the KA's entire engine, leaving the other two 15A fuses needing for power from elsewhere. Are you sure the white and red wire is the dummy light wire that needs to connect to the alternator? I'm using a tundra alternator on a 2j in a usdm s13. I tested the red / white wire and it's got constant power from the battery. These pinouts match what I've found on my s13 (1990). Last edited by Black R; 09-08-2015, 05:15 AM. 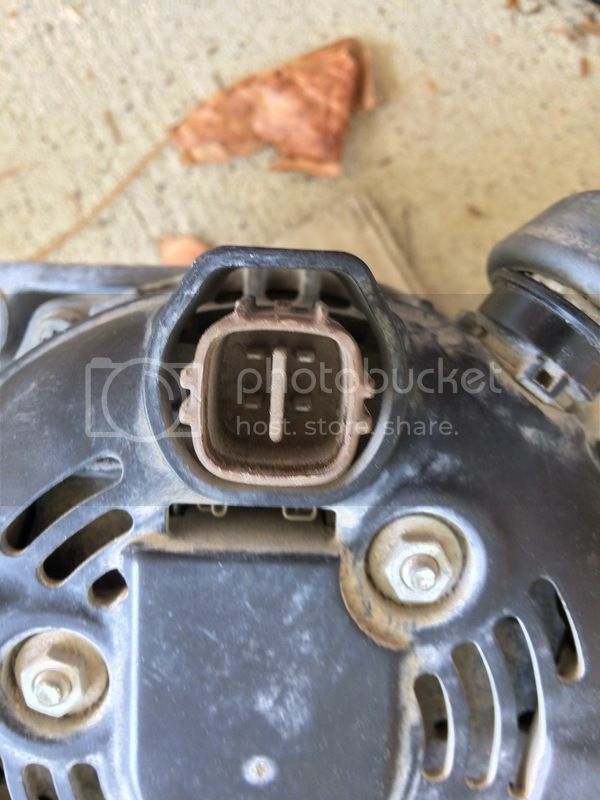 I was referring to the W/R wire that's on the lower harness which connects to the Standard Nissan alternators through the 2 pin gray connector. 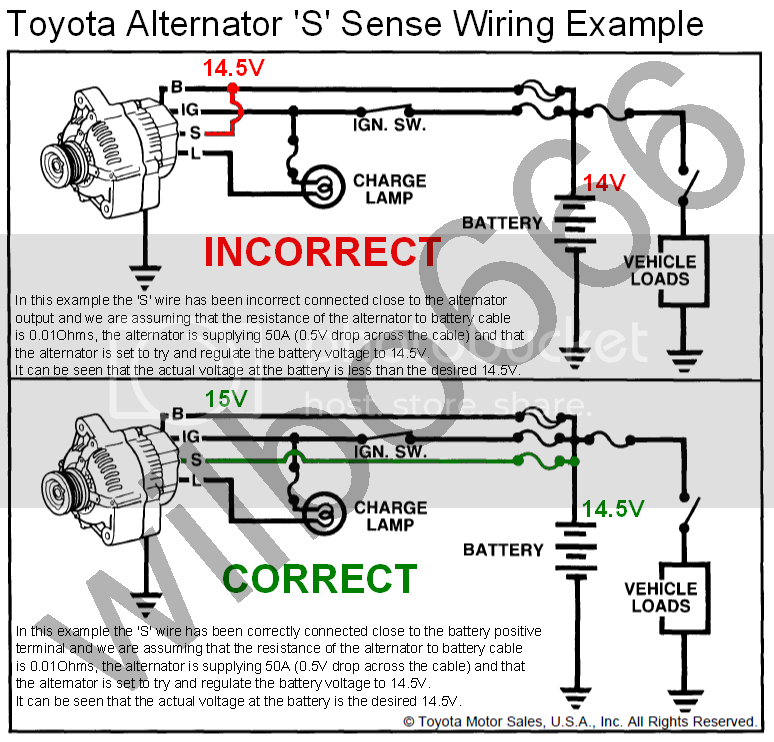 I'll take a look at the tundra charging schematic and then provide more feedback for your exact setup. I wired it up and it runs my 240 pretty well, but won't charge the battery. The wiring is a hack job by the previous owner though, so that's surely suspect. 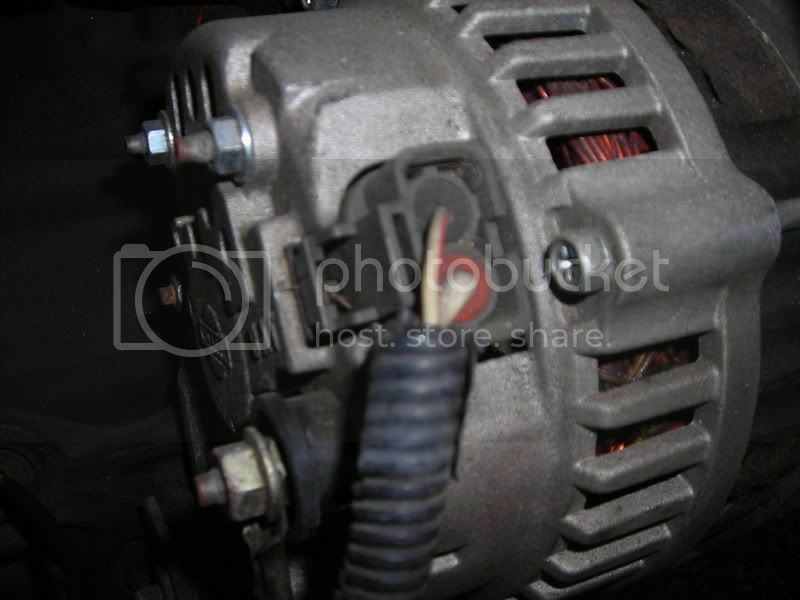 Can anybody tell me which wires from the fuse box I should wire up to the tundra alternator? The big stud on one side is I assume charging output to battery? The wire colors are white, blue, black, red. M = B = goes to positive battery harness (fused). It is on the other side of the ignition switch connected to the positive side of the battery, but furthest from it. L = red wire = charge indicator lamp in gauge cluster - Is this needed to complete the charging circuit on s13? Last edited by Black R; 09-08-2015, 05:10 AM. IG- the black/white striped wire at the gray engine to chassis harness connector near the RH headlight. S- connect this to the large white wire in the lower harness that would normally connect to the schassis alternator output. Large stud run a 4AWG wire directly to battery, bonus points for a fuse in here. Where in the lower harness would you suggest as the most accessible location to tap in for the w/r and solid white wire? *The wiring in this car has been hacked up pretty good by one of the previous owners (from when it had a twincam), and then again when I paid a local guy to wire up the swap - I'm now cleaning up and fixing it myself. Last edited by Black R; 09-10-2015, 11:30 PM.